That concept can be simply explained. The ship is sinking; the band plays on; the music drowns. This definitive 1990 recording was recorded live by the Gavin Bryars Ensemble in a disused Napoleonic water tower in Bourges. That perfect sonic environment is matched by the murky recording that mixes the strings, interview recordings and various random sounds into an ocean of sound, to use David Toop's phrase in a literal sense. 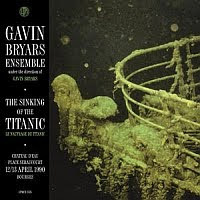 The feeling of going down with the ship is palpable, as the composer recreates the experience of listening to the Titanic's band play the hymn "Autumn", even as they are being submerged. It's quite a dark album; if you have no fear of drowning now, you might feel differently in an hour.